Primarily, one who assists in the performance of the rite of circumcision by holding the child upon his knees; secondarily, one who in a measure takes the place of the father, interesting himself in the lad's welfare. In the first sense the function of the godfather undoubtedly has its origin in Hebrew antiquity, and arose naturally from the necessity of having some one to assist the mohel, or circumciser, by holding the child firmly during the performance of the operation. In Talmudic literature the godfather is called "sandik" or "sandikus," a term which is usually identified with the Greek σύνδικος (Latin, "syndicus"), in the sense of "representative," "patron," "advocate." Kohut ("Aruch Completum," vi. 84) and Löw ("Lebensalter," p. 84) claim, on the authority of the medieval rabbinical works "Roḳeaḥ" and "Or Zarua'," that the correct reading is , and identify it with the Greek σύντεκνος ("companion to the father": comp. the German "Gevatter," French "compère," Spanish "padrino," which all contain this idea of association with the father). 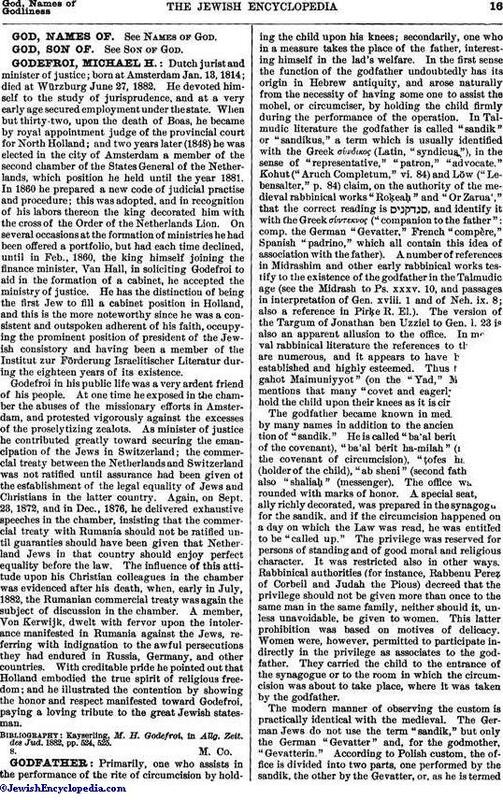 A number of references in Midrashim and other early rabbinical works testify to the existence of the godfather in the Talmudic age (see the Midrash to Ps. xxxv. 10, and passages in interpretation of Gen. xviii. 1 and of Neh. ix. 8; also a reference in Pirḳe R. El.). 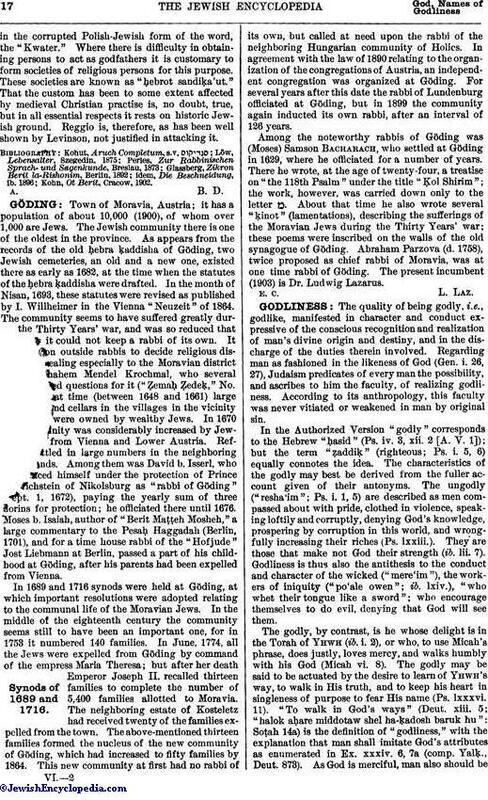 The version of the Targum of Jonathan ben Uzziel to Gen. 1. 23 is also an apparent allusion to the office. In medieval rabbinical literature the references to the office are numerous, and it appears to have been well established and highly esteemed. Thus the "Haggahot Maimuniyyot" (on the "Yad," Milah, iii.) mentions that many "covet and eagerly desire to hold the child upon their knees as it is circumcised." The godfather became known in medieval times by many names in addition to the ancient designation of "sandik." He is called "ba'al berit" (master of the covenant), "ba'al berit ha-milah" (master of the covenant of circumcision), "ṭofes ha-yeld" (holder of the child), "ab sheni" (second father), and also "shaliaḥ" (messenger). The office was surrounded with marks of honor. A special seat, usually richly decorated, was prepared in the synagogue for the sandik, and if the circumcision happened on a day on which the Law was read, he was entitled to be "called up." The privilege was reserved for persons of standing and of good moral and religious character. It was restricted also in other ways. Rabbinical authorities (for instance, Rabbenu Pereẓ of Corbeil and Judah the Pious) decreed that the privilege should not be given more than once to the same man in the same family, neither should it, unless unavoidable, be given to women. This latter prohibition was based on motives of delicacy. Women were, however, permitted to participate indirectly in the privilege as associates to the godfather. They carried the child to the entrance of the synagogue or to the room in which the circumcision was about to take place, where it was taken by the godfather. The modern manner of observing the custom is practically identical with the medieval. The German Jews do not use the term "sandik," but only the German "Gevatter" and, for the godmother, "Gevatterin." According to Polish custom, the office is divided into two parts, one performed by the sandik, the other by the Gevatter, or, as he is termedin the corrupted Polish-Jewish form of the word, the "Kwater." Where there is difficulty in obtaining persons to act as godfathers it is customary to form societies of religious persons for this purpose. These societies are known as "ḥebrot sandiḳka'ut." That the custom has been to some extent affected by medieval Christian practise is, no doubt, true, but in all essential respects it rests on historic Jewish ground. Reggio is, therefore, as has been well shown by Levinson, not justified in attacking it. Kohn, Ot Berit, Cracow, 1902.